Azure is Microsoft’s hosting platform for delivering the complete Microsoft stack in the cloud. It’s flexibility enables you to quickly build, deploy and manage applications across a global network of Microsoft-managed datacenters. Azure’s scalability and on-demand architecture make it an ideal platform for your Microsoft Dynamics GP deployment. of Hosting Microsoft Dynamics GP on Azure? The recent release of Dynamics GP 2015 R2 includes scripts and utilities designed to make deployment on Azure easier than ever before. As a result, an increasing number of small and mid-sized businesses are recognizing the cost and capabilities benefits of hosting Microsoft Dynamics GP in the cloud with Azure. When you make the decision to host your Dynamics GP installation in the cloud with Azure, you don’t have to worry about setting up an infrastructure or procuring and configuring hardware. As a result, deployment can be completed in a fraction of the time. Upgrades and patches can be applied in less time as well. Previously, businesses had two options in how they chose to deploy Dynamics GP – in the cloud or on-premises. In addition to cloud hosting, Microsoft Azure introduces a third option – hybrid deployment. This method of deployment enables you to move selected workloads to Azure while keeping other workloads on-premises or at the data center. Never too much or too little, Azure’s infrastructure scales to meet the demands of your growing business. Need to increase data storage, add more users, or integrate additional applications with your Dynamics GP deployment? 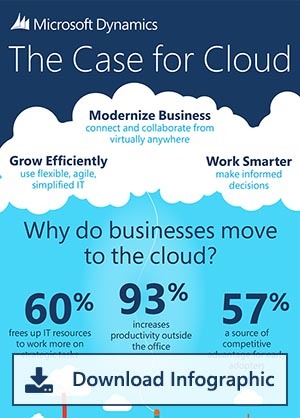 Microsoft Azure adjusts to accommodate your changing needs quickly and seamlessly. Instead of storing your company’s data on a single machine, Azure distributes it across multiple machines throughout Microsoft’s massive server architecture. This provides a layer of redundancy that keeps your Dynamics GP deployment running in the event that maintenance needs to be performed on one of the machines. Hosting Microsoft Dynamics GP on Azure is an extremely cost effective deployment option. There is no costly hardware to purchase or maintain and Azure’s scalable platform means you only pay for what you actually use. The result can mean significant savings for your organization. If you would like more information on hosting Microsoft Dynamics GP in the cloud with Azure or if you have an existing deployment you want to migrate to Azure, please email us or call 1.855.MIG.CORP (644.2677). You can also request free, no-obligation quote that will explain your deployment options as well as the costs associated with each option.